What does the first major official report on the outcomes of marijuana legalization tell us? Not too much…and that’s greatly to its credit! The Washington State Institute for Public Policy (WSIPP, pronounced “wissip”), which is the official think tank for Washington’s state legislature in Olympia, has been charged with comprehensively assessing the costs and benefits of marijuana legalization for Washington’s citizens. The initiative that legalized recreational marijuana back in 2012, I-502, explicitly requires reports from WSIPP in 2015, 2017, 2022, and 2032. It published the first of those reports (authored by Senior Research Associate Adam Darnell) yesterday. As I argued in my August 2014 report about Washington’s knowledge-sensitive approach to legalization, we can only hope that having a respected, independent research organization announce that it is too early to judge the results of legalization will help create a space for calm, evidence-based policymaking in what are still the very early days of this brave new policy regime. Advocates awaiting official results will have to wait until September 1, 2017, for WSIPP’s preliminary evaluation of outcomes. In the meantime, yesterday’s WSIPP report is a rich resource for anyone hoping to understand the evolution of Washington’s marijuana policies. First there is an excellent narrative account of legal and regulatory developments in Washington from the passage of the state’s Uniform Controlled Substances Act of 1971 through the recent 2015 laws designed to harmonize medical marijuana with the new regulated recreational system, simplify the tax structure, and share revenue with local governments. There is also a thorough review of local government policies and the level of commercial marijuana activity in each county. There are undoubtedly plenty of questions for WSIPP as it goes forward. Some of the most important effects of legalization may be subtle or difficult to monetize. 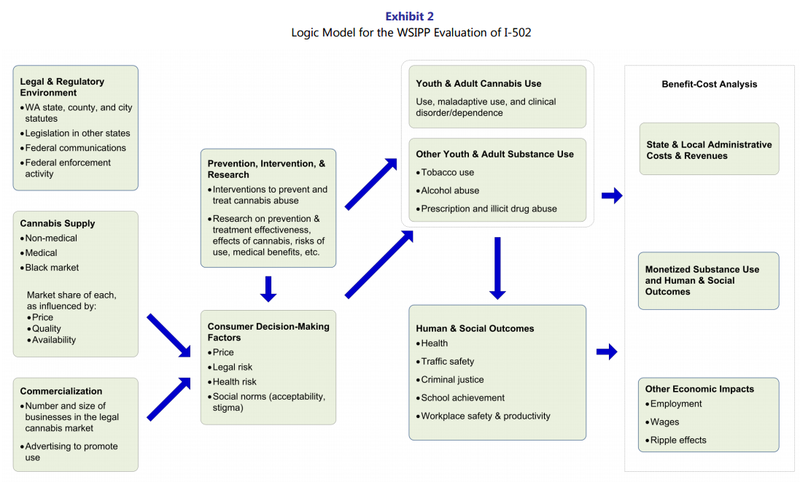 Measurement issues will be thorny, as will the attempt to untangle causal effects of legalization from other ongoing trends—challenges WSIPP is well aware of, but could benefit from thoughtful outside perspective on. I encourage interested readers to read the whole report.